With the effect of globalization, the form of the markets has been changed all around the world, as well as it has also changed the way in which business is carried out in the past years. One of the major revolutions, as a part of globalization, is the foreign trade that implies the buying and selling of goods and services, in different countries of the world. Next, there is one more drastic change as a result of globalization, i.e. foreign investment, wherein the individuals and companies invest their capital in the companies headquartered in another nation. Both foreign trade and foreign investment brings external capital to the country which triggers the growth of the nation. 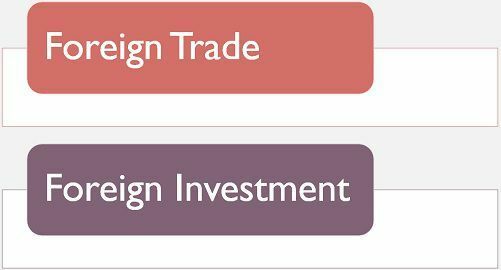 Let’s take a look at the given article, to understand the difference between foreign trade and foreign investment. Meaning Foreign trade implies the trade of goods, services and capital between two countries of the world. Foreign investment refers to an investment made in a company from a source outside the country. Result Integration of markets of different countries. Additional investment in the form of capital, technology and other resources. Advantage It creates an opportunity for the producers to cover the international markets. It brings long-term capital to the company. Objective To earn profit and excel global market. To generate returns in long term. Foreign trade can be understood as the act of trading products and services in the international markets. It facilitates the availability of goods in the market of the country, different from where it is produced. It results in the increase of choice of goods, as the prices of the similar goods are almost equal. Therefore, the producers compete with one another. Foreign trade is needed in a country to fulfil its resource requirements, meaning that the trade between two countries takes place because no country is self-sufficient. So, to meet out its requirement of natural or man-made resources, it engages in trade with the country, which possesses these resources in abundance. Further, the countries that are rich in certain minerals or other items find it beneficial to export it to other countries. Foreign trade occurs in the form of import, export and entreport. Foreign trade is subject to trade policy which are the directive principles and the control measures, that helps in administering the exports and imports of the country. Foreign investment implies investment made by foreign nationals or foreign corporates in substantial proportion in the domestic company, in that they hold extensive ownership and also controls the management of the company. Foreign Direct Investment: Investment from a source outside the nation, into the production or business of a company. Foreign Portfolio Investment: Investment by the foreign company, in the securities market of another country. Foreign Institutional Investment: Investment by foreign investors in the passive holdings of the company, that operates in a different country. Exchange of goods and services across the national borders of the country is known as foreign trade. On the contrary, Foreign investment implies the type of investment that a company or individual from a country makes, in the equity of the company located in another country. Every country does not possess all the resources, and that is why, foreign trade is required, to fulfil the demand for the resources which are deficient in a country. Conversely, foreign investment tends to fulfil the capital requirement of the company, from the source outside the country. Foreign trade connects the markets of different countries of the world. In contrast, foreign investment brings additional investment to the company in the form of money, technology and other resources. Foreign trade creates a good opportunity for the domestic producers to capture global markets and increase their overall reach. As against, foreign investment tends to bring long-term capital in the company and that too in foreign currency. The primary objective of foreign trade is to earn a profit and create an impression in the international market. Unlike, a foreign investment which is made with an objective to generate returns in the long term and have an ownership stake in the company based in another nation. Both foreign trade and foreign investment leads to the increase in country’s Gross Domestic Product (GDP), which becomes an important source of economy’s development. To sum up, foreign trade involves buying and selling of goods and services; in international markets, foreign investment is all about money invested for the long-term by foreign companies.